The WASLA Student + Emerging Professionals Committee will be hosting an LARE Preparatory Session in Seattle, WA for Section 1: Project and Construction Management and Section 4: Grading, Drainage and Construction Documents. 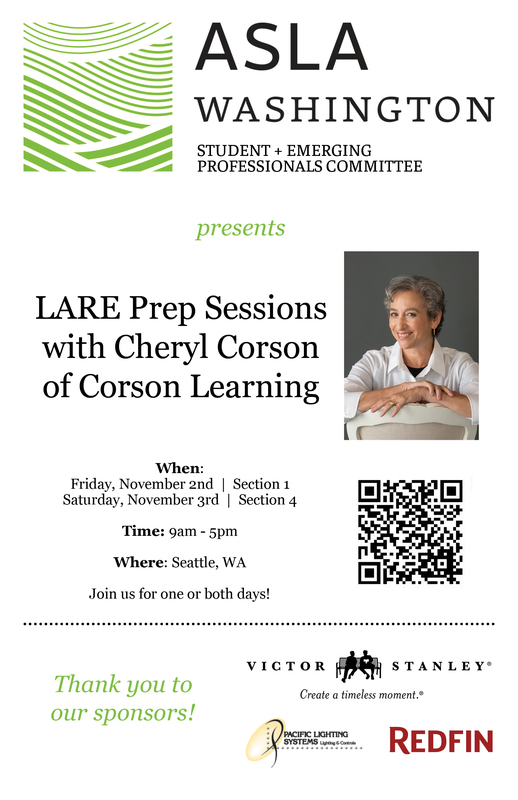 Cheryl Corson of Corson Learning (corsonlearning.com) will be leading the prep sessions. Breakfast and lunch will be provided each day for the participants. Registration is open to all regardless of WASLA membership or location. Space is limited space so don't delay registering. Early bird pricing ends September 10th. Registration ends on October 26th. Thank you to our sponsors Victor Stanley, Redfin, and Pacific Lighting Systems! Cheryl Corson is a licensed landscape architect, writer, and teacher. She began her design practice, Cheryl Corson Design, LLC, in 2003. Before that she served as Communications Manager at the National Institute of Building Sciences, and Continuing Education Manager at the ASLA, assembling the Annual Meeting educational program from 1996-1998. Cheryl Corson is author of the award-winning, Sustainable Landscape Maintenance Manual for the Chesapeake Bay Watershed, available online at no charge. She delayed obtaining her license for as long as she could (16 years after receiving her MLA from the Harvard GSD), undertaking the LARE process between 2011 and 2013. She received her license, after first failing Section 4, in 2013, and within months offered her first LARE Prep webinar to offer others the help she wishes she’d had. Since then, Corson Learning has helped about 700 pass the LARE.